I recently learned that a revolutionary new lightbulb had been invented by Energon Thermodynamics, one that promises to make all others obsolete. I am interviewing Larry Trudeau, their CEO about it. Radstein: I just read your press release, and knew I needed to learn more. It says your new product will make lighting our homes practically free. How can that be? Trudeau: A lot of us have abandoned incandescent bulbs in favor of more efficient CF (compact fluorescent) light bulbs. While they use less energy than the old style, they still do require you to pay your local gas and electric company each month. Energon Thermodynamics has one-upped them big time with nuclear light bulbs. They generate their own energy, so after the initial investment of buying them, you are finished paying for them. All you need to do is turn them on. You can even leave them on if you like. Radstein: That sounds amazing! How do they work? Trudeau: A small piece of decaying radioactive material, kind of like the stuff that used to be on the arms of glow-in-the-dark watches is in the base of each one. This powers a tiny generator that lights the filament of the bulb, producing a clean natural light that does not flicker, and will not make your eyes sore if you read under it. Photographs taken under this light, unlike fluorescents that make everything look ugly, will look perfect like they were taken outdoors on a sunny day. Radstein: That sounds dangerous. Won't these expose us to radiation? Trudeau: Not any significant amount. You would be exposed to a lot more by going out in the sun. The generator consumes almost all of the radiation the nuclear material releases. The mercury in one CF bulb is more of a danger than a whole house full of these. 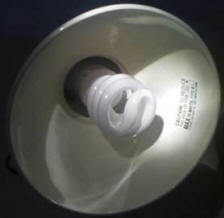 There is so much mercury in one CF bulb that you create a toxic waste spill if you drop one and break it. Now that is dangerous! You cannot even throw them out in the regular trash. Radstein: How about your nuclear light bulbs? Can you leave them out with the trash? Trudeau: You will never need to. The material that powers them will last 80 to 100 years. We also design the filaments to last a lifetime, much like the original Edison light bulb. Radstein: What will happen if you drop one of these? Is there anything to worry about? Trudeau: Well, you will need to handle them carefully when you install them. It wasn't a standard household size bulb, but a floodlight that a careless installer dropped once. It blew up taking out several city blocks, and made a spectacular mushroom cloud. Radstein: My God, that is terrible! How could you ever sell these things to the public? What are you thinking? Trudeau: Sorry, Ben! I was only pulling you leg to see if you were paying attention. That did not happen. Dropping one won't cause nuclear fission, and won't break it. The translucent globe is not glass, but a virtually indestructible material that is like something out of Star Trek, only it is real. You would have to really go out of your way to break one, and if you did, you could get rid of it anywhere you can get rid of a car battery. It is no big deal. If the filament would ever burn out before the power center did, an unlikely scenario, we can even replace the filament module at no cost to you. The warranty will cover it. Radstein: How soon will we be able to buy these, and how much will they cost? Trudeau: We are still waiting for regulatory approval. The CF people are lobbying the US Congress and Canadian Parliament to try to stop us. They are making up ridiculous and false horror stories. That hairy fib I told you a minute ago when I was teasing you was actually one of theirs. After all, our product makes their whole industry obsolete. The horse-and-buggy industry tried to stop the automobile, and the record companies are trying to stop the Internet, but you can't turn back the clock. As for pricing, we estimate that standard household bulbs will cost about one hundred dollars each initially, and cylindrical modules to replace fluorescent tubes will be a little more, but you will only have to buy them once. They will more than pay for themselves. Goodbye CF. Hello nuclear light bulbs from Energon Thermodynamics! Radstein: Thank you for taking the time to talk to me today. I know you are a busy man. Trudeau: Oh, don't be silly. It was no trouble at all. I am certainly not too busy to let people know about this amazing new revolution in lighting. There you have it. Energon Thermodynamics has invented a nuclear light bulb that powers itself. I am still uneasy about radiation exposure and safe disposal of these bulbs. I am a bit concerned that he did not tell us the whole story, but getting rid of the light bill each month is quite an interesting concept.